I ran into a page on the Microsoft web site that was showing a compile error. It’s fairly unusual but the developers over at MS are only human and they are going to make mistakes sometimes. 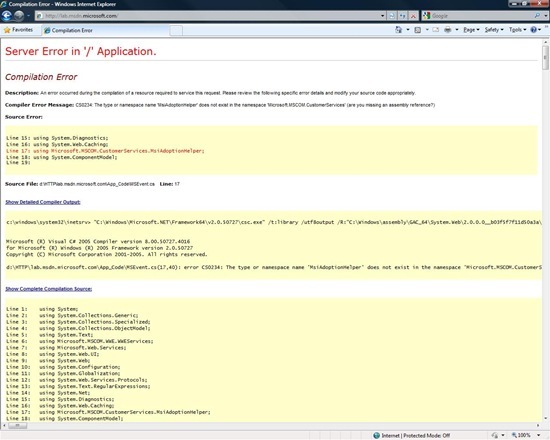 What I thought was particularly interesting was that the CustomErrors option in their web.config was set to Off, showing the full source code of the page. The page is at http://lab.msdn.microsoft.com/ but I’m sure they will have fixed it by the time you read this so here is a screen shot.